When building desktop applications these days, most of the application that I build are either raw utilities or very document centric applications. I'm currently working on the latter and for those it's quite common to have a single application instance that displays all documents inside of that single instance. To deal with this in an application you need to be able to detect that another instance is already running and then pass some information - usually the file name arguments - on to the original instance so that it can open the requested documents. 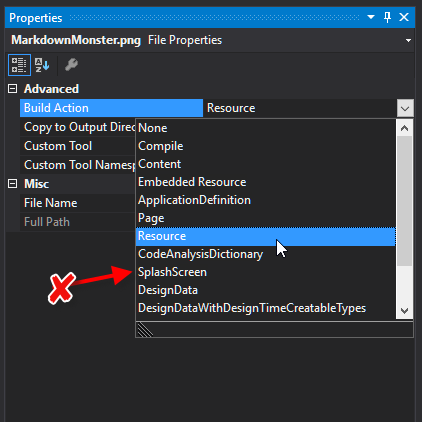 To set the stage I've been working on a WPF application in my spare time over the last few weeks called Markdown Monster. 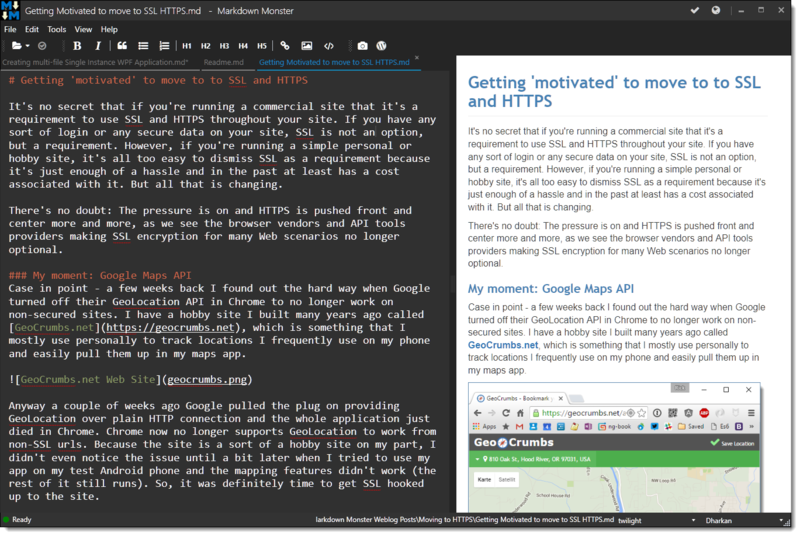 It's a document based application to handle Markdown editing with an extension model so you can easily plug in custom functionality. Trying to keep the editor fairly minimal and use extensions to provide most of the useful support functionality. Some extensions that I'm building are for screen captures with SnagIt and a WebLog publishing add-in that I started using to post my blog posts. It's been a fun project to play with - it's been a while since I've used WPF and I realized I still hate it even while recognizing that there's so much that you can do with it if you put in the time. After a bit of struggling I was able to get my first usable prototypes built and I've now been using it to get my last few blog posts - including this one - published with it. So one of the features of this editor is that it should run as a single document that displays all open documents in tabs. Markdown Monster associates itself as an editor for .md documents, so when you select a new document it should just open documents in a new tab rather than a whole new application instance. There are a lot of different approaches available to do this and while looking for solutions on how to accomplish this effectively most of the solutions struck me as overly complex. First instance needs to detect the request to open new files. Most of the samples I've seen for Singleton based apps don't address the communication aspect of the second instance forwarding parameters - or if they do, they are using a fairly complex communication mechanism. When I started out on this I started with simplest thing I could think of, which is writing command line arguments to a file from the second instance, and using a FileWatcher to pick up the file and read the command line arguments from it. It worked but I ran into some problems - that it turned out were unrelated to the FileWatcher approach. While trying to figure out some crazy WPF Kernel crashes during early shutdown (which were unrelated to the FileWatcher code in the end), I also created a NamedPipes implementation. While a little more code, it's a cleaner and more direct approach that lets the two instances directly communicate with each other. Let's see what this looks like in this WPF app. A default WPF application is different than most other .NET applications in that it hides the Main() function. Main() still exists of course, but it's generated as part of the generated App class that WPF creates (in App.g.cs). The goal for secondary instances is to immediately detect a second instance and exit before WPF gets control. As you can see from the code above, if you leave the default Main() in place, the earliest you can get control is in the App constructor. I ran into major issues with early shutdown due to the SplashScreen screen. I'll talk about this later, but if you do have a SplashScreen in your app make sure you do not auto show the splash screen on early exits as it will randomly crash your app due to background thread shutdown issues. Instead WPF relies on App.xaml and its corresponding .cs class to handle all the startup management code. Looking at the main method above you can see the earliest you can get control in App is in the constructor and that's where we can put the startup check. So this code is hooked up to the constructor. SingleInstanceCheck() does all the work and if this is not the first instance the code exits the application using Environment.Exit() immediately. To do the startup detection the code uses a Mutex - a mechanism you can use as a cross process 'CriticalSection' that determines whether the Mutex is already in use in any other process on the machine. It's an easy and efficient way to signal boolean state across multiple applications. The code then proceeds to create a string of any command line parameters that were passed, so we can pass filenames to open to the first app. These values are then passed using the small, custom NamedPipeManager class which I'll describe below which basically sends the command argument string to the primary instance. Once that's done Environment.Exit() then shuts down the secondary app. The primary instance now also uses the NamedPipeServer to listen for messages on a separate thread. When it receives a message it picks up any (if any) files and opens them in new tabs. All of the code runs inside of a Dispatcher because the code needs to interact with the UI for opening new tabs and activating the form. If there are files, these files are iterated and then opened in new tabs by parsing the lines out of the string. This code uses the StringUtils class from Westwind.Utilities and then loops through the strings, opening each in a new tab. Then the main form is activated and pushed to the top of the call stack and made visible. The code for this is pretty short and mostly generic so it's easy to implement for other solutions. To simplify the NamedPipe access I created a small wrapper class around NamedPipes that handles the server and client side. It's very basic single purpose implementation where the server only listens for a string and the client only sends strings. /// easy to pass string messages between two applications. /// Called when data is received. The server portion creates a new thread that waits for incoming connections and it just sits on the background thread waiting for connections to come in. When a connection comes in it reads the data from the pipe, and fires the ReceiveString event with the string. The code then restarts the Pipe listener to listen for the next connection. To shut down the server a special EXIT command is sent which causes the server to break out of its loop and... exit. The client creates a new PipeClient, connects to the server with a short timeout and if it finds a server pushes a message at it. This server is very basic but it does what it needs to do and it's easily reusable as is. And that's all of it really. It just works. I want to spend a minute talking about some of the problems I initially ran into with my Singleton implementation. When I initially added this code I added it to OnStartup() which is the traditional place where you put 'startup' code. 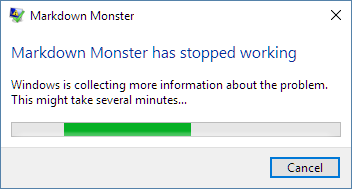 These crashes occurred about 70-80% of the time and were not trappable by the application itself. Even using the AppDomain.UnhandledException event wouldn't capture the errors, and hooking up a debugger revealed that the errors were occurring in Windows Kernel mode. Yuchhh. I struggled with this for a long time and initially I thought it was the file access/Filewatcher interaction. It took a while, btut eventually it became clear that the problem was the SplashScreen that caused the problem. Although SplashScreen is very lightweight, it does get fired on a new thread, and by doing early exits in OnStartup or even the ctor was causing the SplashScreen to loose connection to the App which would then cause it to blow up. Typical Windows background thread problem. It took me a long time to figure this out because SplashScreen is hidden by default in generated code. Docs I've seen also seemed to indicate SplashScreen actually runs native code, but that's not actually true - SplashScreen is just a lightweight form like structure that can run before WPF has properly initialized. The key to fix that problem was to not fire the SplashScreen when secondary instances are loaded. To do this I had to remove the SplashScreen from the project settings (ie. uncheck the SplashScreen build action) and instead manually load the splash screen only when the app is launching for sure. which causes the SplashScreen code to get removed from the Main() method. You can then manually show the SplashScree it after the early exit logic is done. subsequent pages won't see the splash screen. Either approach works to avoid the random crashes. I talk about the SplashScreen class here which uses an image, but the same is true if you bring up your own custom WPF splash form. Just make sure you shut it down before exiting or you will potentially crash the app hard. Finally - if you don't have or need a splash screen you don't need to worry about any of these issues. Generally I'm not a huge fan of Singletons, but after playing around with Markdown Monster without the ability to open multiple documents in the same instance, I find it annoying to have new instances pop up everytime I open a file. The app also remembers the last files that were open and then reopens all those files (a la Sublime) and if you have multiple instances that behavior can get really funky as multiple instances would step on each other 'configuration' settings of what was open last. And there you have it - everything you need to know about single instance WPF applications. Note that the same approach will also work for WinForms applications, where you would likely hook up the startup single instance check in the Main() function. Thank you, beautiful post. Very helpful and straightforward. "...the earliest you can get control in App is in the constructor..."
Not quite true, you can use a static constructor in your overridden 'App' class that will execute before any static 'Main()' function, whether compiler-supplied or otherwise.